Dual-effect pedal utilizes company’s unique foot-control designs. Option Knob, a custom controller company, has announced the Danger Zone, a distinct—and distinct-looking—phaser/tremolo pedal. 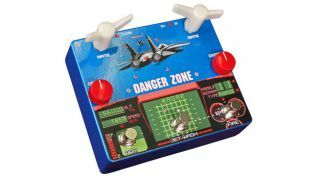 The Danger Zone utilizes Option Knob’s unique approach to controls, enabling the player to make adjustments using a foot rather than by hand. The two Rate knobs—one each for the Tremolo and Phaser effects—sport the company’s “WingMan” foot-control design, and the Depth controls for each effect boast large round knobs that are placed on the left and right outer sides of the pedal, making it possible for guitarists to use a foot to brush the sides of the knobs to change depths. The Danger Zone is being offered for $249.95. For more information, head over to Option Knob.